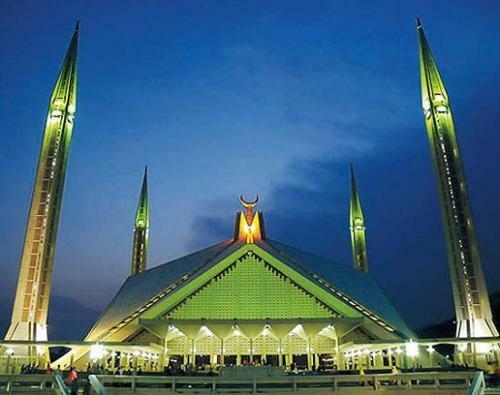 Pakistan is a very beautiful country as it is a land of splendors and a great tourist destination. The landscape changes from high mountain ranges like the Himalayas, Karakoram and Hindukush in the Khyber Pakhtunkhwa Province in the North to the Punjab plains and deserts onward to the Arabian Sea. There are a myriad mountain peaks in Pakistan, the tallest being K-2 which is the second-highest peak in the world (8,611 meters), after Mount Everest in Nepal. The 806-kilometer-long Karakoram highway constructed on the ancient route between Pakistan and China is the highest trade route in the world. In the province of Punjab we have rich agriculture land and rivers, and shrines, forts and gardens, which depict the Mughal era. More than 2,000 years ago, Gandhara Buddhist civilization flourished in northern Pakistan, with Taxila as a seat of Buddhist learning. Baluchistan is the largest province (by area) of Pakistan, constituting approximately 44 percent of the total land mass of Pakistan but little of the population. Baluchistan is rich in mineral resources; it is the second major supplier of natural gas in Pakistan. It has natural beauty, a range of mountains, salt mines and a long coastal belt. The province of Sindh in the south also abounds in natural beauty as well as having been a cradle of the ancient civilization of Mohenjo-daro. The southern city of Karachi is the commercial hub of Pakistan and includes a port and beautiful sea beach. In addition to the natural beauty of the four provinces of Pakistan, the people of Pakistan are extremely hospitable and generous to tourists, especially foreign guests. Tourism is the engine which mobilizes all the other business markets of a country thanks to tourist expenditure, resulting in rising socio-economic conditions. Pakistan is a country with breathtaking natural beauty and variety of flora and fauna. From the mighty stretches of the Karakorams in the North to the vast alluvial delta of the Indus River in the south, Pakistan remains a land of high adventure and nature. Trekking, mountaineering, whitewater rafting, wild boar hunting, mountain and desert jeep safaris, camel and yak safaris, trout fishing and bird watching are a few of the activities which entice adventure and nature-lovers to Pakistan. The Himalayas, Karakoram and the Hindukush ranges with their alpine meadows and permanent snow line, coniferous forests down the sub-mountain scrub, the vast Indus plain merging into the great desert, the coast line and wetlands, all offer a remarkably rich variety of vegetation and associated wildlife including avifauna, both endemic and migratory. Ten of 18 mammalian orders are represented in Pakistan with species ranging from the world’s smallest surviving mammals, the Mediterranean Pigmy Shrew, to the largest mammal ever known; the blue whale. 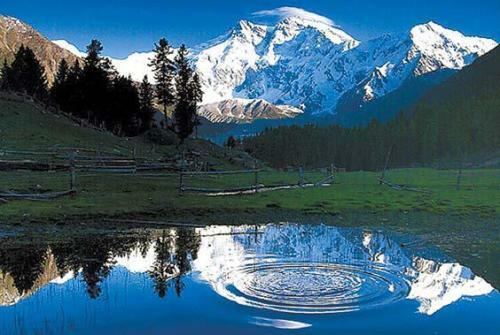 Northern areas of Pakistan, spread over 72,496 square kilometers, are as fascinating as the southern. 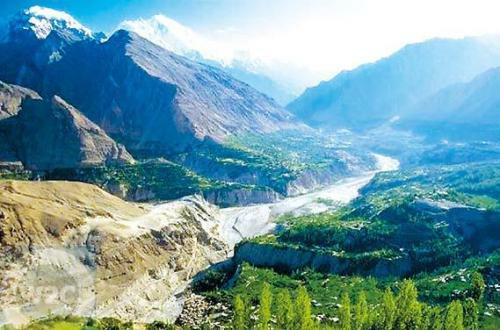 Amidst towering snow-clad peaks with heights varying from 1,000 meters to over 8,000 meters, the valleys of Gilgit, Hunza and Skardu recall Shangri-La. The cultural patterns in this region are as interesting as its topography. Modern Pakistanis are a blend of Harappan, Indo-Aryan, Indo-Iranian, Saka, Parthian, Kushan, White Hun, Afghan, Arab, Turkic and Mughal heritage. Waves of invaders and migrants settled down in Pakistan throughout the centuries, influencing the locals and being absorbed among them. Thus the region encompassed by modern-day Pakistan is home to the oldest Asian civilization (and one of the oldest in the world after Mesopotamia and Egypt), the Indus Valley civilization (2500-1500 B.C.). The Khunjerab Pass, which the Highway crosses, and the nearby Mintaka Pass lie astride the fabulous ancient Silk Route that led from Europe to Asia and by which history’s most famous travelers once came. These include the Venetian trader Marco Polo, after whom were named the wild Marco Polo sheep in the 13th century, the Chinese Monk Fe Hien in the fourth century and the Arab historian Al-Beruni in the 11th century. Establishment of Heritage University of Taxila: For the promotion of cultural relations between South Korea and Pakistan, a Korean-based organization, M/s Gandhara Art and Culture, has expressed an interest in the establishment of an institute for post-graduate studies, the “Heritage University of Taxila (HUT).” The aim of this institute would be the revival of the ancient glory and academic excellence of Taxila, and also to study, highlight and publicize the important aspects of the Gandhara civilization.